31865 PARKINSON & FRODSHAM, LONDON. 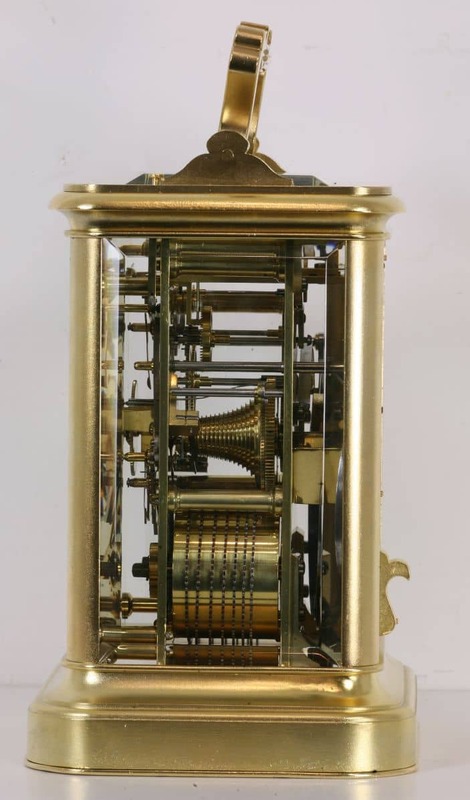 AN IMPOSING GIANT STRIKE/REPEAT CARRIAGE CLOCK. CIRCA 1840. 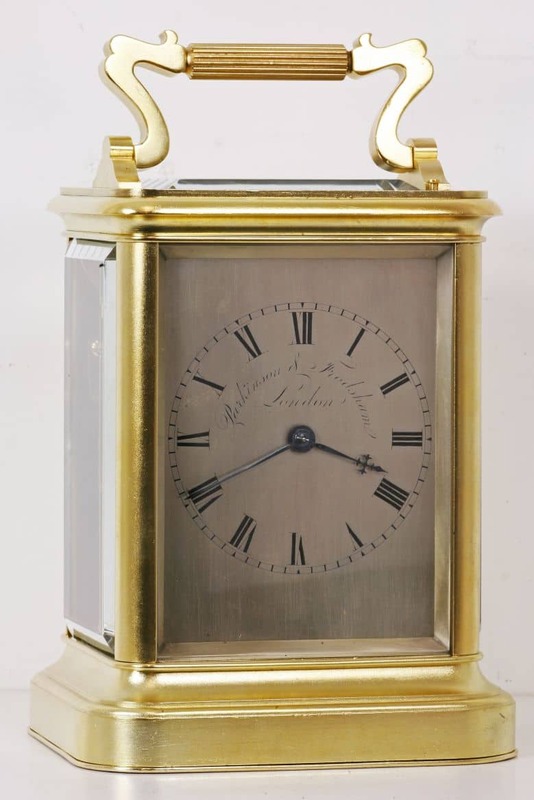 A large and imposing English giant carriage clock. The gilded case with nicely shaped carrying handle with reeded centre has a small repeat button by the right hand fixing of the handle. The case has rounded corners and a plain stepped base. It has a solid rear door with shutters for winding and hand setting and a slide at the top for regulation. The door lifts out. There was some evidence that at some stage the case was bronzed. The baseplate and other areas have a stamp for the case maker FD. There is a scratch mark which appears to say “delivery July 1838”. It was scratched on before the case was prepared for the movement as some of the movement fixing holes go through it. We believe this is the case maker’s delivery date. The silvered dial is signed for the makers ‘Parkinson & Frodsham, London’. 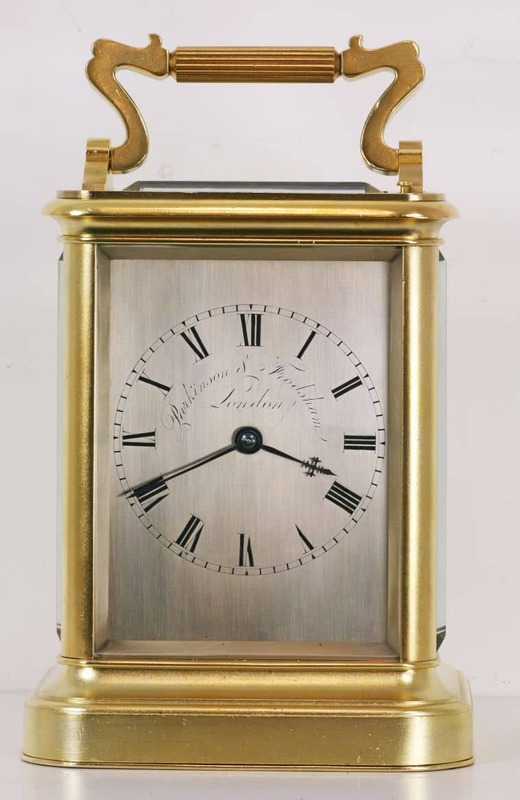 It has blued steel ornate cruciform and pointer hands and Roman numerals. 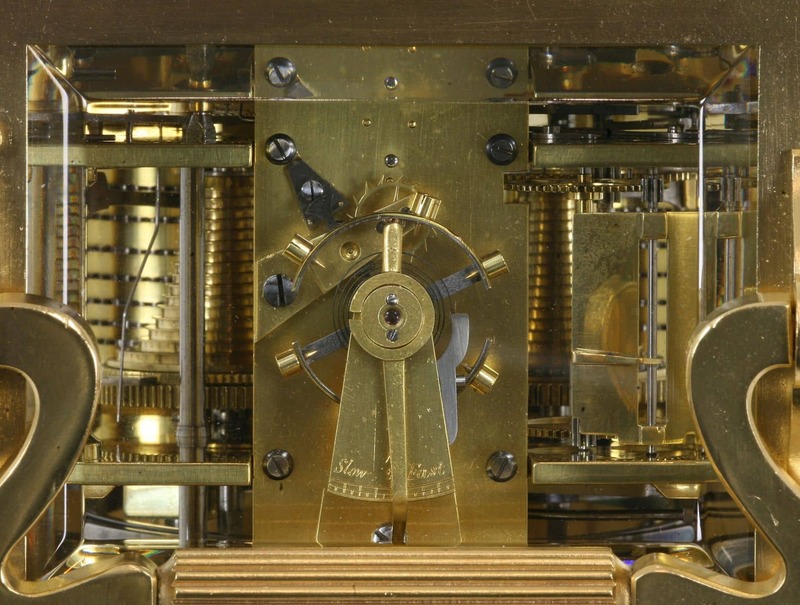 The eight day twin chain fusee movement is of the finest quality, as one would expect from these makers. It has a high quality lever escapement on a large platform with a temperature compensating cut bi-metallic balance with timing and poising screws. The clock strikes the hours on a coiled steel gong mounted on the backplate. 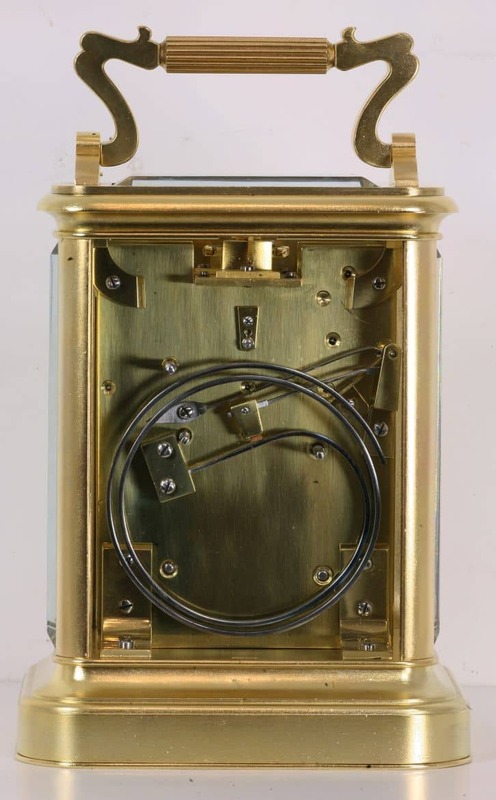 The movement is securely fastened in the case with four brass brackets. The first of the clockmaking Frodshams was William who was born in 1728 and may have worked as a Journeyman for Justin Vulliamy. In 1779 he took his son, William, into partnership and the business became William Frodsham & Son. 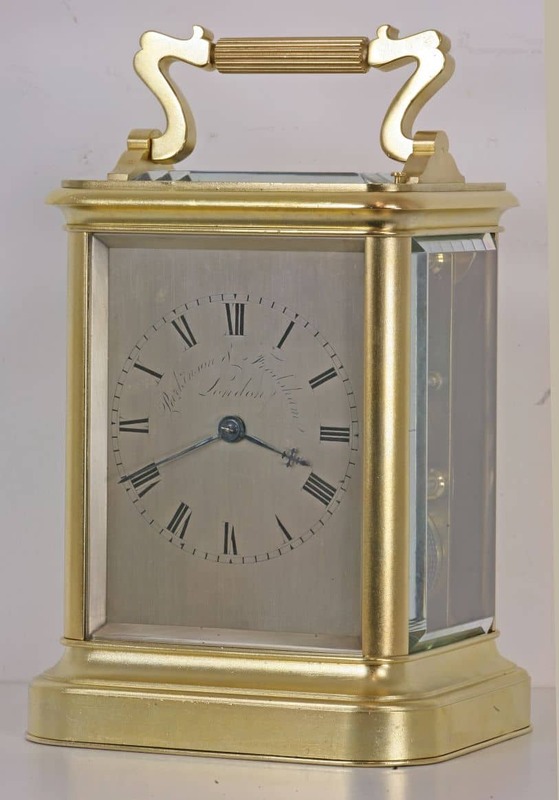 In 1801 William Frodsham, the elder, set up his grandson, William James, in business and in partnership with William Parkinson and thus was born Parkinson & Frodsham, one of the best known names in chronometer making. William Frodsham (the son) died before his father in the 1805 and John Frodsham, his son, took his father’s place in the partnership. Parkinson & Frodsham commenced business at 4 Change Alley, Cornhill where they remained until 1890. 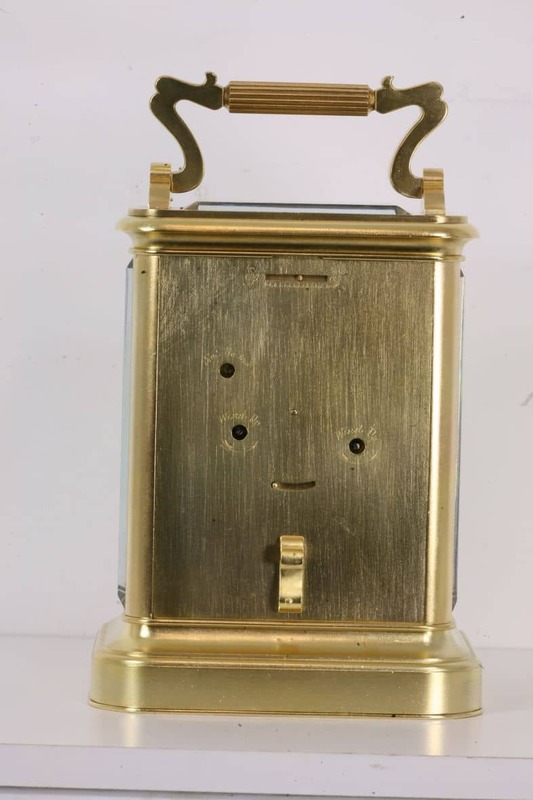 William Parkinson died in 1842 and the business was continued by William James Frodsham who handed it over to his two sons, George and William, in 1847, the year that those sons were admitted to the Clockmakers’ Company. The business prospered over the years and they were as highly thought of during the time they were active as they are today. They exhibited at the Paris Exhibition in 1867, the Le Havre Exhibition in 1868, Calcutta in 1883 and again at Paris in 1889 and so as can be seen they were internationally renowned. In addition to their address in Change Alley, Cornhill, Parkinson & Frodsham opened a branch in Liverpool in 1828 firstly at 54 Castle Street and then 38 Castle Street in 1828. This business continued until 1858 when Henry Frodsham died. Thereafter, his wife continued the business in partnership with Robert Keen and in 1869 it was changed to Frodsham & Keen, the name which it kept until 1935 when it closed.